As usual, when there are two polarized opinions regarding a topic, the truth is not to be found at either extreme. This is not the disastrous flop of political correctness the nay-sayers would have you believe. Nor is it the triumph of inclusive cinema its supporters want you to think. Instead, it is a reasonably competent but almost entirely unnecessary product of the Hollywood machine. Its production cost about five times as much as the original, and this runs about half an hour longer – but is it as funny? I’d be inclined to say, no, and that’s what renders it “mostly harmless,” as Douglas Adams might say. Not to say there aren’t pleasures to be had here. As expected, McCarthy is not actually a bad substitute for Murray; likely a little short (in ways both literal and figurative), but holds her own well and exudes a similar refusal to give a damn. The rest of the cast are a bit more of a mixed bag. For 95% of the film, McKinnon appears to be little more than a grab-bag of irritating tics in lieu of genuine character, and it’s probably a good thing Jones is as marginalized as Ernie Hudson was (I find a little of her comedic schtick goes a long way, personally). Wiig was probably the most pleasant surprise, managing to combine brains with heart to good effect, though Chris Hemsworth’s delightfully dumb secretary was a bit of social commentary that actually worked. The biggest problem is the apparent lack of chemistry between the leads. The original had scenes, such as the trio sitting around eating Chinese food, which managed to convey the idea of them being a team. I never got that impression in the reboot, where they felt more like standalone individuals. 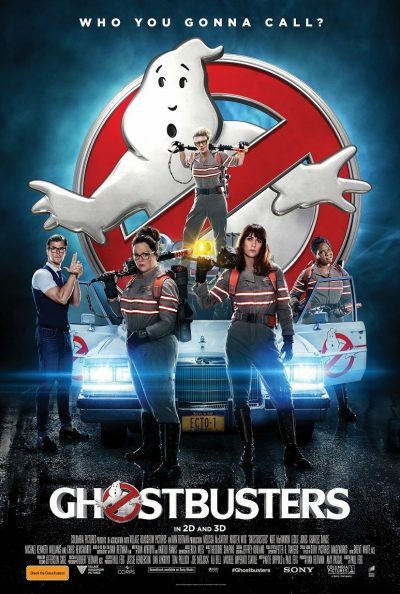 Indeed, the new film could have been made with a single Ghostbuster – pick whichever one you want – as the focus, and wouldn’t have been significantly different. It’s certainly slick, and on a technical level, is a marvel to behold. But the climax goes on and on and (I think this is largely why it’s 27 minutes longer) on and on, to the point where it becomes a numbing, Michael Bay-like spectacle. Remakes are always a duel-edged sword. Go off a popular movie, and you get a built-in audience and can ride on the coat-tails of name-brand recognition. For instance, I did enjoy the cameos from a number of the original cast, who pop up at various, largely unexpected moments. The downside is, your film will always be compared to its predecessor, and typically needs to be better than average to stand up to this test. That’s where the 2016 version falls short. On its own merits, this would be decent entertainment, albeit largely forgettable – I literally cannot recall a single memorable line, and I only watched this three days ago. But when you’re putting yourself beside one of the most beloved comedies of all time, “decent entertainment” no longer cuts it. Here’s my not-so bold prediction. In 30 years time, probably a great deal sooner, this will be all but forgotten, while the original will continue to be loved.